Paul Andrew is a designer you don’t tend to hear a lot about, and every time I feature his shoes, I wonder why on earth not. These ‘Orbit’ sandals, for instance, are beautiful, in an understated kind of way (Maybe that’s why, actually: perhaps people prefer shoes to be beautiful in an over-stated way? ), and I suspect they’d be even MORE beautiful in the flesh (or in the satin, as the case may be) than they are in the picture. 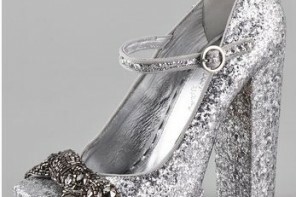 These have the standard slingback shape and peep-toe vamp we see so often on dress shoes, but the stiletto heel is covered in crystals (Again, not a totally unusual touch for this kind of shoe), and the vamp is secured by what I’m going to describe as a decorative pin, although I’ve no idea what I should be calling it. It’s a detail I haven’t seen too often, and is what made these stand out as I scrolled through the Shopbop website. Mules tend to be a “Marmite” kind of style – you either love them or hate them. When they look like this, I love them – they’re simple and elegant, and I can see these working really well with a pair of black cigarette pants or a pencil skirt – instant, retro-inspired glamour! And what a difference that extra bit of height makes to the heel!